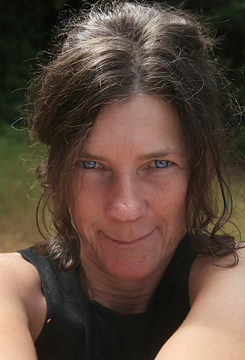 BangaloREsident@1 Shanthi Road, Karin Apollonia Müller was born in Heidelberg, Germany. She holds a Masters in Film and Photography from The Folkwang School, Essen, Germany. She has received numerous awards and fellowships, among them a Villa Aurora Grant at the Feuchtwanger House in Pacific Palisades, CA, USA and an artist commission from the Getty/CAL Arts Grant, Los Angeles, CA, USA. She is represented by Diane Rosenstein Fine Art in Los Angeles and Julie Saul Gallery in New York. Her work is exhibited continuously in solo and group shows across the United States and Europe. Her work has been placed in the collections of The Museum of Modern Art, New York; The Whitney Museum, New York; LACMA, Los Angeles, among others. The latest aquisition this year is from Soho House, London. She has published four monographs, Angels in Fall, On Edge, Timbercove and Gate. © Karin Apollonia Müller Karin Apollonia Müller's primary focus has been how man interacts and struggles to fit into the urban and natural landscape. She hopes her work will be seen as continuing to ask the timeless questions of who we are, where we are and what we are. In her early work Karin Apollonia Müller used the tool of documentary photography. She has been dealing with her notion of the disconnection of human being to their urban environment. She is interested in how man interacts and struggles to fit in to the urban and natural landscape. She defines the concept of “urban landscape.” Furthermore, she has been concentrating on photographing away from cities, in more remote areas, to try to understand fundamental relationships of things in nature. 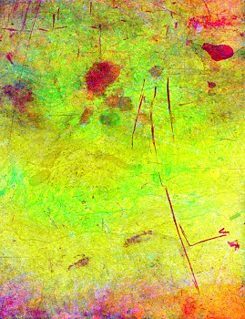 Lately, Karin Apollonia Müller has delved deeper by using found images on a macro and microscopic scale. This formal basis allows her to explore and document deeper her notion of the relationship between the human being and the world; it also allows her to enter a world of her imagination and come closer to her idea of Eden. Currently she is doing research on cells and cell structures. A cell is the container of information as to who we are and where we have begun. Here she would like to explore the very beginning of creation myths and the science and stories of how we - human, animal and landscape - have evolved over time. In Bangalore, Karin Apollonia Müller will investigate even further her notion of “Landscape” and her idea of “Eden”. This time – The Orient – curious and excited about a new adventure and definition. I have never seen him, the muezzin, however I have heard him over and over again, 5 times per day roaring from all corners, from somewhere, particularly in the morning, directly before sunrise. I - listening. Gradually the chirping of birds are getting mixed with the sound of the muezzin. A glimpse of yellow morning light appears. Quick and soon the call of the muezzin and chirping of the birds were drowned out by the sound of the driving and honking cars, racy motorcycles and steaming trucks. Now the day was there. The sun high above the town. Mona, mantras warbling, is scrubbing the kitchen and preparing chai tea for me with her tanned hands. Shanthi Road lies directly on one of busiest, noisiest streets of Bangalore in the middle of the city, Richmond Circle. I remember John Cage's quote: "The sound experience is the experience of silence." I took the noise level positively for the occasion and recorded the sound around me. © Karin Apollonia Müller For all the noise and chaos there was this constant, awesome gentle smile of the Indians. It gave me hope and security, like the everyday breathtaking sunset. If I had not experienced it myself, and if I had not have spread out my yoga mat every day, I would be wilted like a German primrose. OM! My experience in spite of all adversities was immense, colourful and powerful. The victory lay above the external world. Following the flow of the day, I moved into an academically, scientific and culturally, artistic world. My interest has always been in how man interacts and struggles to fit into both the urban and natural landscape. Lately I am interested in where we are coming from, and how the world has evolved. I cannot take photographs of this. However, I can use found photographic images and use them for my investigation. 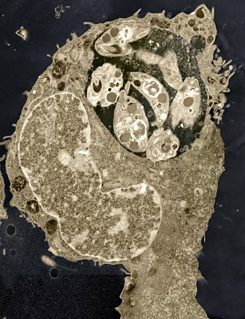 So I had the idea to work with cell images. Cells are the container of information as to who we are and where we have begun. The weak internet in Bangalore gave me the information that there was the National Centre for Biological Sciences in Bangalore. Fascinated and excited I contacted the Goethe-Institut who got me in touch with NCBS immediately. The very next day I met with Lena at NCBS who does her research on cells of zebrafish. She showed me the fish and how they spawn and grow. And she got me in touch with other researchers doing their analysis on zebrafish, drosophila or butterflies. Then I had an appointment with Dr. Varadharajan Sundaramurthy. Varadharajan, well dressed in white linen and purple plastic gloves, was intrigued by my thoughts about the world, and my idea to visualise a beginning of our universe with cell images. Like two curious little kids we sat there and philosophised. But there also was Ashish, Rajan and Lena who generously provided electron microscope images. And thanks to Aparna U. Banerjee I was able to stay in one of the campus guest houses. The drive from Shanthi Road to NCBS was pretty far through the city. So finally I enjoyed the chirping of the crickets at night and a morning swim at the pool on campus. After the swim I indulged myself with a traditional South Indian Masala Dosa, a sort of pancake with spicy potato paste. Strengthened after breakfast I delved again into scientific discussions between test tubes, microscopes and slides. © Karin Apollonia Müller After a good week I swept back to Shanthi Road. There I met my host Suresh with a cultivated beard and dressed in finest black silk. Looking in his deep brown eyes we talked about culture and art. Delighted about the affection, openness and cooperation of all I have met in Bangalore, I am eager to sort out and work on my notes, sketches, recordings, images, colours, thoughts and slips of paper and I returned to Germany - back to my computer. I am a little sad, but I felt pressured by my time and my curiosity. My very best thanks go to Goethe-Institut, Director Christoph Bertrams, Director Dr. Claus Heimes and Programme Coordinator Maureen Gonsalves, and in Shanthi Road, Suresh Jayaram and Sandeep TK, in NCBS, Aparna U. Banerjee, Dr. Varadharajan Sundaramurthy, Ashish Dhayani, Rajan Thakur, Lena Robra and Shaistai for great cooperation.